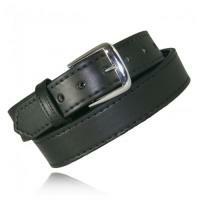 Boston Leather duty belts are famous for their durability and quality, and this off-duty belt is no different. It is made from 10 to 12 ounce full grain English Bridle leather and drum-dyed in black or cordovan for a deep, rich color. An extra layer of leather lining gives it extra weight and strength, and its high level of craftsmanship ensures that this belt will last. Its thickness also allows it to support the weight of a holster if needed. The belt is available in a plain or a basketweave finish, and comes with sturdy nickel or brass hardware.